Academy Award winner Brie Larson is joining the Marvel Cinematic Universe in 2019’s Captain Marvel, which casts her in the title role, as well as the cosmic hero’s alter ago, Carol Danvers. Captain Marvel has been an ally and teammate to The Avengers over the years, and now we have the first, official look at how she’ll appear in the film, as well as some of the non-human supporting characters. Directed by Mississippi Grind filmmakers Anna Boden and Ryan Fleck from a script by Tomb Raider screenwriter Geneva Robertson-Dworet, Meg LeFauve (Inside Out), Nicole Perlman (Guardians of the Galaxy), and Liz Flahive and Carly Mensch (Glow), Captain Marvel is set in the 1990s and explores the powerful hero’s adventures in the time before Captain America and Iron Man came to prominence. Here’s everything we know so far about Captain Marvel, the studio’s first female-led solo superhero movie. After hinting that something big was going to happen September 5, Larson and Entertainment Weekly revealed the first, official image of Larson as Captain Marvel. 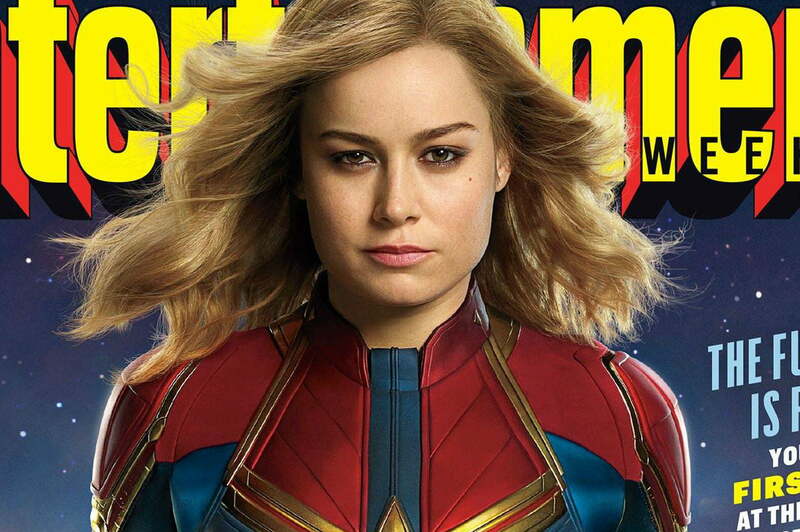 The image was accompanied by a gallery of official images and a feature that offered a few more details about the plot of Captain Marvel, which will be set after she gains the abilities that make her one of Marvel’s most powerful heroes. 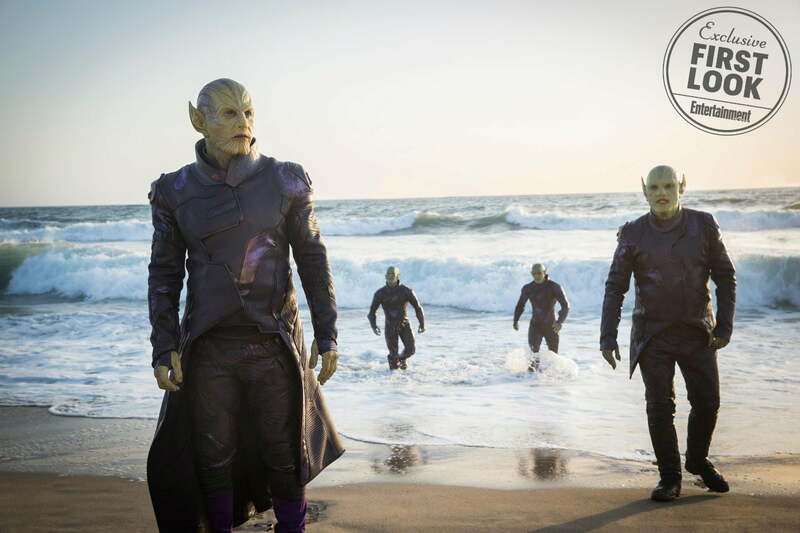 Among the images was the first look at the Skrulls, the shape-changing aliens that will make their debut in the film. 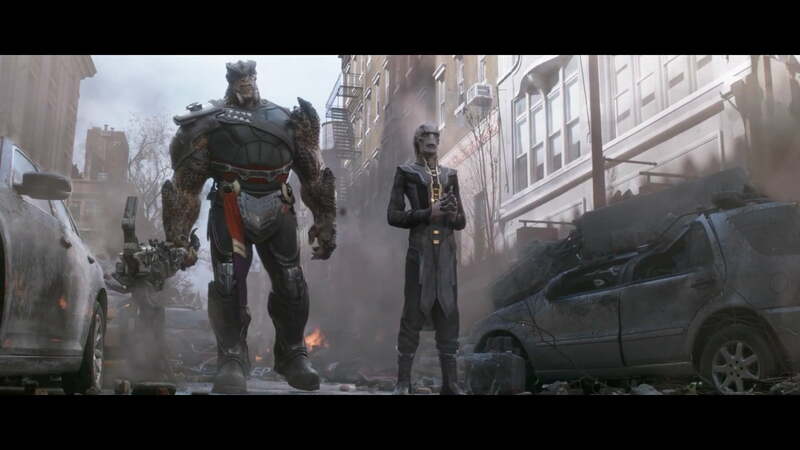 Also appearing in the gallery are returning characters Korath (Djimon Hounsou) and Ronan (Lee Pace) from Guardians of the Galaxy, as well as new characters played by Jude Law and Ben Mendelsohn, among others. Mendelsohn plays the Skrull villain of the film, seen in the image above in his alien form, and in a second image in his shape-changed human guise. Given everything that transpired in Avengers: Infinity War (including a particular post-credits scene) and the seemingly long stretch of time until Captain Marvel hits theaters, it’s no surprise that Marvel movie fans are looking for reasons to keep talking about both films and make the wait seem a little shorter. A thread on Reddit is focused on determining whether a piece of cloth worn by Infinity War character — and one of Thanos’ henchmen — Cull Obsidian could hint at a past encounter with Captain Marvel. The scene captured in the image shows Cull wearing a sash-like strip of cloth on his hip that appears to have the same red, blue, and gold colors as Captain Marvel’s uniform. Given the 1990s setting of Captain Marvel and its cosmic story elements, it’s entirely possible that Cull had a run-in with Carol Danvers at some point, and Marvel has never shied away from including nods to its other films — past or future — in each movie it releases. However, quite a few Reddit users have indicated that the color similarities are just a trick of lighting, and that the cloth is actually a different color. At this point, the debate over the sash has become the comic-book-movie equivalent of 2015’s viral “What color is this dress?” question, and Marvel doesn’t seem inclined to step in and settle it any time soon. According to The Hollywood Reporter, four-time Oscar-nominated actress Annette Bening has joined the film’s cast. No word on Bening’s character has been given, save for the fact that she will be a scientist of some sort, though rumors suggest she may be playing Danvers’ mother. Whoever she ends up playing, we expect it must be an important role, given Bening’s pedigree. A series of photos from the set of Captain Marvel found their way online in March, just a few days after cameras began rolling on the film. While the 1990s setting for the movie had already been confirmed, the photos offer an indication of just how ’90s the characters will go for the film. The photos were posted on Twitter by fan feed Captain Marvel News, and feature Larson — as well as other members of the cast — adorned in some impressively period-appropriate attire for the ’90s. Welcome to the jungle, Carol Danvers. Marvel released a photo from production on Captain Marvel on March 26, 2018, to announce the start of principal photography. The first photo from the set of the film features Larson (left) alongside Brigadier General Jeannie Leavitt, 57th Wing Commander (right), at Nellis Air Force Base in Nevada. In Marvel Comics continuity, Danvers is an Air Force pilot who gained powerful abilities when her DNA was fused with that of an alien species during an explosion. She initially took the name “Ms. Marvel,” but eventually inherited the title of “Captain Marvel” from the original character who went by that name. 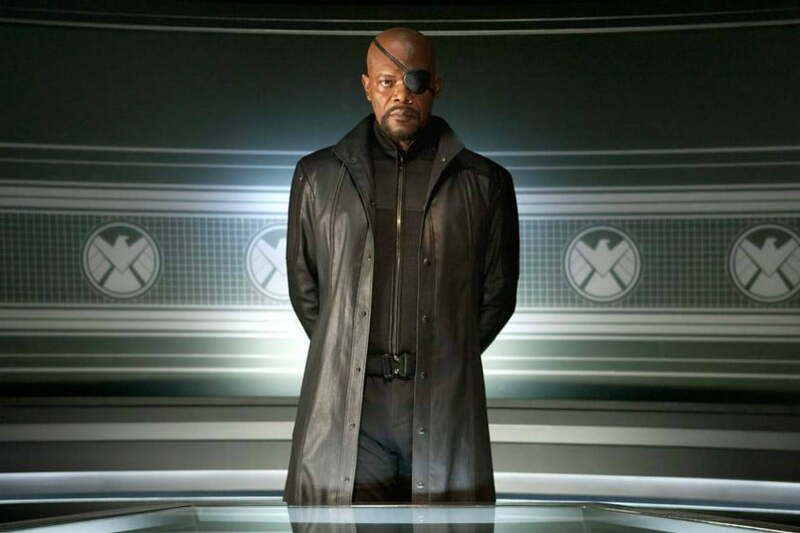 The Captain Marvel movie is set in the 1990s and features Samuel L. Jackson as a younger Nick Fury (when he still had two eyes) and is expected to use the shape-changing aliens known as Skrulls as the film’s villains. Marvel’s announcement regarding the start of filming was accompanied by an official cast listing for the movie, which includes some unexpected returning characters from the studio’s cinematic universe alongside the previously announced newcomers. Along with Jackson returning as Nick Fury, the film’s cast also includes Djimon Hounsou reprising his Guardians of the Galaxy role as Korath, Lee Pace reprising his Guardians of the Galaxy role as Ronan, and The Avengers and Agents of SHIELD actor Clark Gregg returning as SHIELD Agent Phil Coulson. The supporting cast is filled out by Ben Mendelsohn (Rogue One: A Star Wars Story), Lashana Lynch (Brotherhood), Gemma Chan (Fantastic Beasts and Where to Find Them), Algenis Perez Soto (Sugar), Rune Temte (Eddie The Eagle), McKenna Grace (I, Tonya), and Jude Law (The Talented Mr. Ripley) in the role of Mar-Vell. In January 2018, Larson was glimpsed on the Atlanta set of the still-untitled fourth Avengers movie, wearing what appears to be her Captain Marvel uniform (or some variation of it). The photos of Larson suited up as Captain Marvel were posted by Page Six and feature her navigating the streets of Atlanta (with some help from a map) and giving an unidentified male character a painful handshake (and likely teaching him a lesson of some sort). The fourth Avengers movie unfolds in the wake of Avengers: Infinity War and was confirmed to feature Captain Marvel in a key role. That film will hit theaters a few months after Captain Marvel, in May 2019. Fans of the character have noted that Larson’s costume doesn’t appear to have the same red, yellow, and blue color scheme that Captain Marvel often appears in, but some color-adjusted versions of the photos posted by Twitter user “el_steevo” suggest that this could simply be a result of accounting for green-screen effects in the background. Updated September 5, 2018: Added the first, official image of Brie Larson as Captain Marvel.